Brushes and paint are probably the only original stock we still sell after 46 years, all be it that now the brushes are not for emulsion and wallpaper paste and the paint doesn't often come in 2 litre tins. HAN.D.I.Y.MAN at the bottom of Swingate Lane seems a long way past. We had decided to try shopkeeping, Rod from a background of banking and Tina from Occupational Therapy and motherhood. Rod soon slipped into using his practical skills for picture framing and it wasn't long before Tina was teaching crafts at the local college. 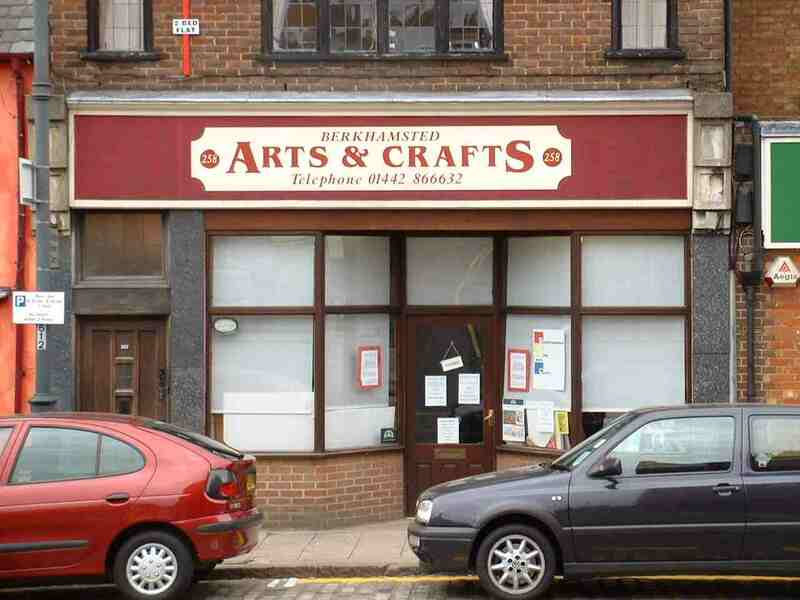 The craft shop seemed a natural progression so in 1978 Dorothea Patterson cut the ribbon on our new venture and Berkhamsted Arts and Crafts was born. It was very soon evident that this side of the business was outgrowing both the premises and our ability to run both, so we decided to move. 'Stanleys' the greengrocers shop was becoming vacant so on December 2nd 1982 we took up residence in our new position at 258 High Street. In our new location we were overwhelmed by the demand for our goods and services and the style of shop changed as we increased our ranges. Further expansion seemed logical, but where? There were few places that looked ideal. After many fraught attempts to find a solution we realised it was staring us in the face and on our doorstep. So that is just what we did – moved the back door step, doubling the shop area and providing ourselves with the space we needed to expand further. However, we soon found ourselves pushed for space again, inevitably filling the space we had, leaving little room for customers to actually shop. Paula, our youngest daughter, joined us in January 2002 as a partner, to carry on the business enabling us to take more time off. It was becoming clear that we were in desperate need of more space so we pulled out all the stops to secure larger premises. We knew that the added space would be ideal not only for the retail side of the business but also to be able to give classes and demonstrations. In 2007, our eldest daughter Jo (and husband Laz) moved back into the area and joined the team here at BAC. Since her arrival Jo has taken on the task of increasing and improving the classes and courses run in the classroom at the back of the shop. As the icing on the cake, Jo and Laz's children Beth and Ben both worked in the shop on Saturdays (before leaving home to get married and attend university) .... so we have had three generations involved in the business. So this is where we're at, after 46 years trading in the town, our ranges are vast. Whether your interest is in Art, Craft, Needlecraft or Stationery we are sure to have (nearly) everything you need. Our staff of Jane(P), Jane(W), Jo, Julie, Karen, Kate, Katy, Lauren(W), Lauren(D), Laz, Paula & Tina all work hard to keep abreast of advances in techniques and changing needs – and we still sell lots of paint and brushes.